Being associated with the IBEW for over 25 years, I have seen and been involved with a lot of changes. I went through the apprenticeship, was a foreman, estimated and project managed, but it was not until I was promoted to my current role as Vice President that I realized the importance of a partnership between contractors and the trade associations. The first thing you think of when being associated with a trade union is the unlimited amount of manpower at your disposal. This is especially true when you are considering working far away from your office. While that is important, it is actually the quality of tradesman you get. The partnership has developed many positive impacts that are directly reflected in profitability. Through hands on training, safety awareness and education, the increased hourly cost per employee is offset by an efficient crew, a quality job and a safe work place. The dynamic of this relationship allows us to work together to remain competitive and relevant as times change. The relationship that I.B. Abel, Inc. has built with the local unions goes far beyond labor versus management. It is truly a partnership in overcoming obstacles, finding opportunities and managing our industries manpower needs to be successful. I wanted to say thank you for all your help during the outage. We were able to do a lot of work for our job and picked up some extra during the issues encountered in alignment. I really appreciate your help in getting me some good help in a hurry when we needed night shift again. The electrical side of things went smooth for the most part and without any major problems. This would not be possible without manpower that understood the system and unique situations of the nuclear industry. Thanks again and hope to see you next year. "Mark is extremely pleased with the mechanics and apprentices you sent. Mark is usually slow to comment, so this obviously is a sincere compliment." I thought you might be interested in some of our safety statistics as they apply to Local 229 Electricians. 2010 has been a very good year for safety performance so far, with Local 229 Electricians helping to lead the way. Last year, our combined OSHA Recordable Rate for Electricians at Peach Bottom Station was zero (0.0). In 2010, the rate again is zero (0.0). We are extremely pleased with the Safety performance of Local 229 Electricians. 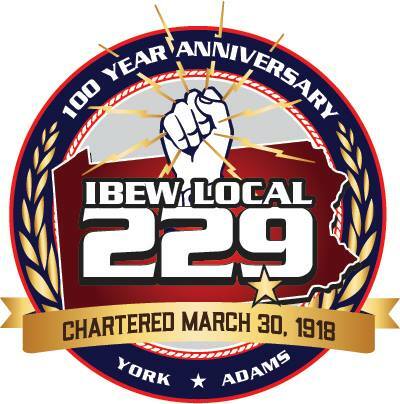 Many thanks to the members of Local 229 as for their enduring commitment to Safety.